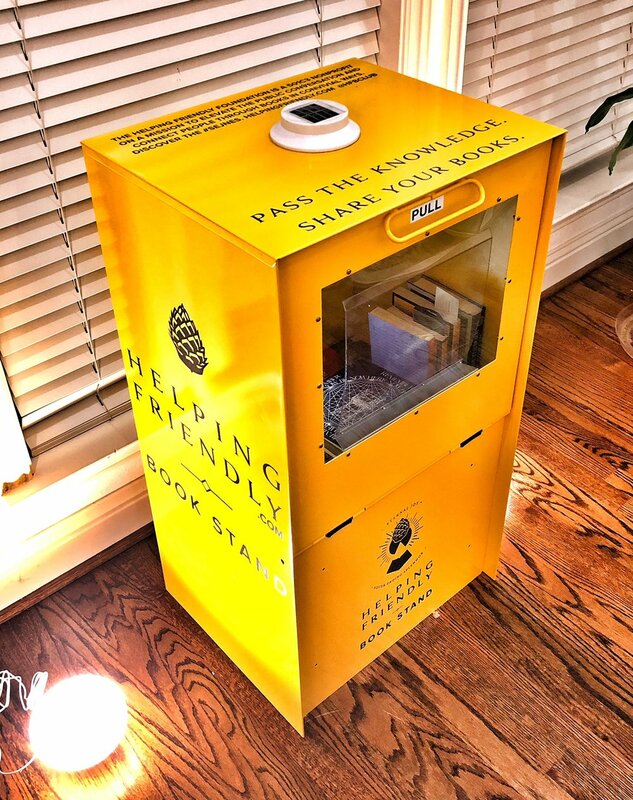 On a physical level, ‘Helping Friendly Book Stands’ are free public book exchanges where people can ‘Pass The Knowledge’ and share their favorite books. On a metaphysical level, ‘Helping Friendly Book Stands’ are the Symbolic tip of Pallas Athena’s Spear of Illuminated Wisdom. How can we really fight fake news? By reading more books and developing our critical thinking. ‘Helping Friendly Book Stands’ are the physical embodiment of The Helping Friendly Book Club’s invisible ideals. In addition to Illuminating Curiosity for the Purpose of Forward Motion, ‘Helping Friendly Book Stands’ Create Space and Stimulation for the Generation of Insights, Support Conscious Connected Community Building, and help Cultivate Social Vitality through Literature, Art and Conversation. One of the things that separate our libraries from all the other free public book exchanges is that ‘Helping Friendly Book Stands’ are part of something greater than the sum of its parts, which is the Quest for SEJNES itself. Each ‘Helping Friendly Book Stand’ is an opportunity, a nudge to those willing to dig a little deeper with the light of their curiosity to discover a community of Questers already engaged on an adventure of the mind and spirit together. ‘Helping Friendly Book Stands’ are like trees because they support everything in the most fundamental way, like the air we breathe. Even though we can’t observe a tree transmuting poisonous carbon dioxide into life-supporting oxygen with our physical senses, we know it’s happening. Libraries do something similar. And when you plant enough trees, at a certain point they become a forest, and a forest truly is something greater than the sum of all its parts. Great societies evolve from great conversations, and we want to help inspire those thoughtful conversations that pull fresh, productive thought patterns into waking life. Why does this project matter to the Community? We see the groundswell of an intellectual movement has already begun, and we want to help connect it in meaningful ways. Books are a great place to start. Two strangers walk into a bar, their relationship is one thing. The same two strangers walk into a bar, see a ‘Helping Friendly Book Stand’, and discover they’ve read the same book. Now their relationship is something else. Suddenly, they’re not quite as strange to each other because they realize they have a shared experience. It is a universal truth that relationships and communities are formed through shared experiences, and valuable shared experiences form valuable relationships and communities. Books are those valuable shared experiences, and the more attractive, accessible and communal they are, the more conscious and connected a community becomes. When a society stops sharing valuable experiences, it begins to decay. Without shared Vision, the people will perish. ‘Helping Friendly Book Stands’ are more than just free community libraries, they are beacons inviting you to follow your pinecone and embark on a journey of self-discovery. ‘Helping Friendly Book Stands’ are guideposts pointing the way toward the Secrets to Eternal Joy and Never Ending Splendor. Each of the first 28 Helping Friendly Book Stands will have a quote from whichever Helping Friendly Book it’s built in honor of. The quote (SEJNES) will be laser engraved on the front of the HFBS in such a way that anyone who wishes to can bring a piece of paper and a crayon and make an old school, tactile “rubbing” of that particular nugget of wisdom. Phase II of the Helping Friendly Plan is to develop a ‘Helping Friendly Book Stand Kit’ that is modular and scalable that we can mail out of state and keep growing beyond our North Texas Community. Phase III, which is the capstone and our true aim, is to reach the point where we’re able to commission artists to create one-of-a-kind, large scale outdoor urban art sculptures that also function as free public book exchanges. To plant this idea squarely in your mind, the aspirational goal for Phase III is to create something in Dallas at least as iconic as the famous Bean Sculpture in Chicago, but that also functions as a free public book exchange. The great news is we’ve already completed most of the time consuming legwork, and now we just need to focus on funding. At this point, because we already have our prototype and manufacturer in place, as soon as we get funding, we’re ready to start planting ‘Helping Friendly Book Stands’ all across our North Texas Community. Everytime we open another ‘Helping Friendly Book Stand’ we’ll have a ‘Stock the Book Stand Party’ at each location, which will also support conscious connected community building, in alignment with our core values. Can you help us make this dream a reality?